This "Surfer's Paradise" book was submitted to the book swap, all the way from Australia, by Ali of Jellygnite. 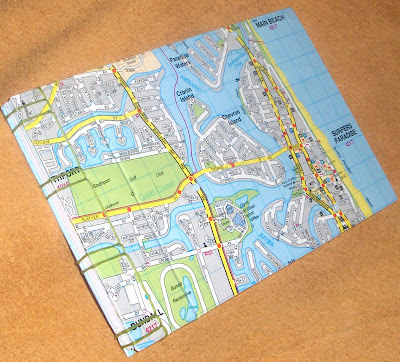 Ali says she has been fascinated and in love with maps for quite a long time; the particular map on this hardcover book, shows the famous Surfer's Paradise and Gold Coast in Australia. 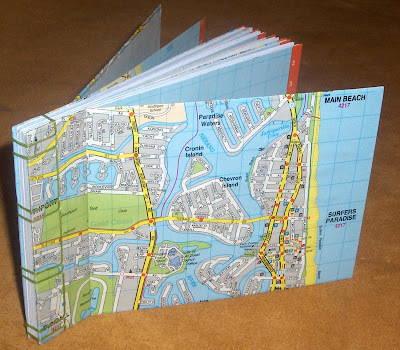 The book is bound using an attractive variation of the basic Japanese stab binding technique, and the inside pages are a mixture of cartridge paper and map segments taken from an old street directory. Visit Jellygnite.Etsy.com to see more of her books. I love maps! I love it when y'all make book covers out of them!